Quantities must be entered in increments of 5. 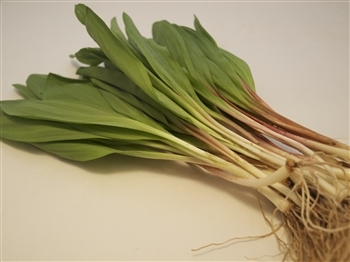 Wild ramps, also known as spring onions or wild leeks, are a delicious spring vegetable that is native to North America. When fresh, their leaves should be bright green. Any yellowing or withering of the leaves is a sign that they might not be fresh. Chefs love their garlic-like aroma and pronounced onion flavor. Ramps are very versatile and pair very well with eggs and potatoes; They are also excellent pickled, which is becoming a very popular preparation among chefs. Ramps are a true sign that spring is upon us!